An electric guitar is a lot of fun. You know what makes it more fun? A great amp. You know what makes it even more fun? Effects pedals. 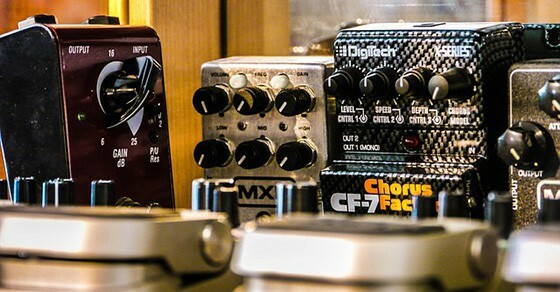 The best effects pedals? That’s an entirely subjective thing, depending on what you’re going for. But I will say this – for $50 or less, if your expectations aren’t absurdly high, you can’t go wrong. So, let’s look at the best guitar pedals for under $50. Note: You’ll likely also want to check out our guide showing the best power supplies for guitar pedals after. 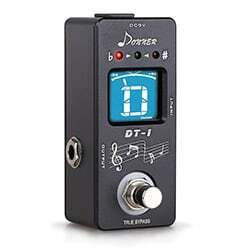 Let’s start with the basics; the Donner DT-1. Every guitarist needs a tuner, and if you’re going to start building your pedalboard anyway, you might as well add one of these to your signal chain. And why should a tuner pedal be expensive? It isn’t an effect – it’s just a handy tool. The Donner DT-1 is only around $19.99, and customer sentiment is mostly positive. Some have complained about unwanted noise, but for that price, you can’t be too sad about that. Donner has many deals just like this one. 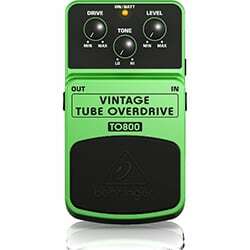 Clearly emulating classic Ibanez Tube Screamer pedals, the Behringer TO800 looks more like a Boss pedal than anything else. And Behringer is sort of known as the inexpensive alternative to popular brands. But at $19.99, and decent reviews, it’s hard to argue with it. But remember – a tube overdrive pedal is supposed to give you a bit of a signal and overdrive boost. 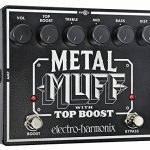 This makes this Behringer product a great choice for boosting during solos or for adding to an amp’s existing gain, but it won’t make you sound like Metallica! Speaking of signal boosts, it can come in handy to have a simple pedal that gives you a bit of an extra punch right when you need it. 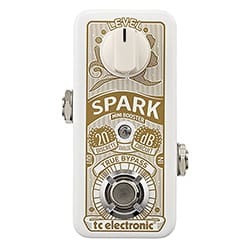 The TC Electronic Spark Mini does just that for $49.99. Since it is a clean boost, it’ll increase your levels without changing your tone too much, and sometimes that’s exactly what you need for a solo. 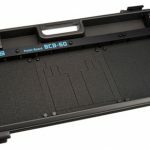 TC Electronic has hit it out of the park with this one. 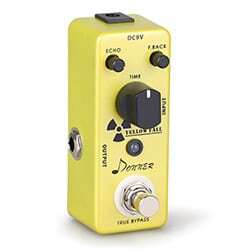 With 315 customer reviews, and a four-and-a-half-star rating on Amazon, the Donner analog delay is worth a look. As with many other Donner pedals, it’s only $35 to boot. And if you aren’t sure what delay is, it’s effectively an echo effect with repeating feedback that decays after several repetitions. It’s part of how U2’s The Edge gets his tone (not this pedal specifically, mind you). 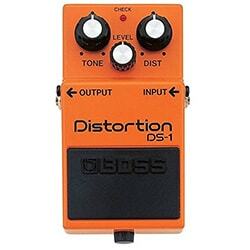 The Boss DS-1 is a classic distortion pedal used by many notable artists – past and present (Kurt Cobain, Steve Vai, Joe Satriani, etc.). And unlike a tube overdrive pedal, it is possible to get hard rock and even metal tones out of it. This isn’t to say that you couldn’t also use it as a boost, however. 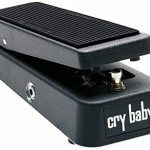 The best distortion pedal for under $50? Maybe not, but it is a solid, reliable pedal with a classic tone. Boss has made some missteps along the way, but $49 is still good bang for buck. Even if you’re already running one or two distortion/overdrive pedals, sometimes it’s nice to have some alternatives. The JOYO JF-02 gives you that classic 70s tube overdrive sound for only $34, and yes, if you’re willing to experiment, you can achieve several different tones with it. You might not have heard of the Chinese maker JOYO, but they seem to know what they’re doing, and many users have been extremely satisfied with their products. 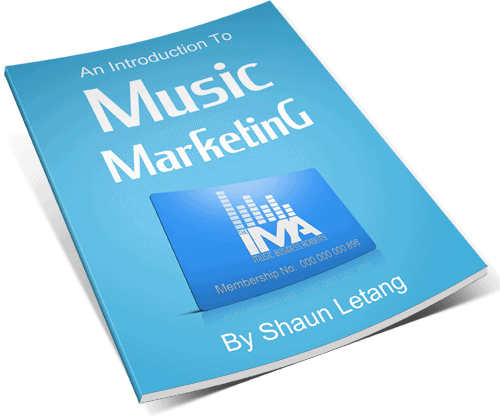 Modulation effects can help you achieve wobbly, swelling and squashing sounds. 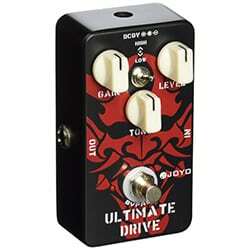 A phaser is a great addition to any pedalboard, and again JOYO comes out on top in the under $50 arena. 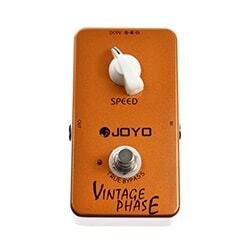 Have a look at the JOYO JF-06 Vintage Phase which will help you achieve classic and funky 70s and 80s phaser sounds for just $34.99. There are plenty of other highly rated delay and overdrive pedals in the under $50 range, but at this point you’re probably looking for something a little different. 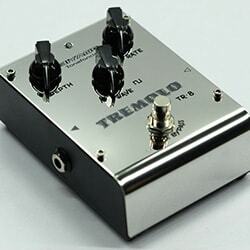 So, here’s a tremolo (another modulation effect) pedal, the Biyang TR-8. It looks cool, it’s only $49.99, and the reviews are decent. For tremolo on a budget, have a look at the Biyang TR-8 via Biyang, also a Chinese pedal maker. 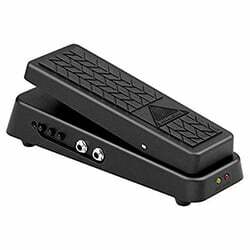 Finding a good wah-wah pedal under the $50 mark is no ordinary feat. But the Behringer Hellbabe HB01 is exactly that. Now if you’re expecting to plug in and sound like Jimi Hendrix or Kirk Hammett, then you’re delusional. But for $49.99, you get a wah-wah, and that alone makes the Behringer worth a look. If you’ve tried it or compared it with other guitar pedals on sale, let us know. This entry is a little different from the others, which is why I saved it for later. Finding all the pedals you need for under $50 each is going to prove tricky. 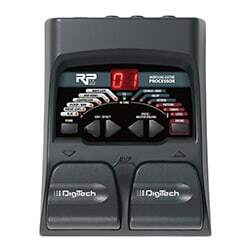 But you can get it all in one convenient place with the DigiTech RP55 featuring 11 amp types, five cabinet types, 20 effects, and a built-in drum machine for just $49.95. It’s certainly not the ultimate solution, even in the multi-effects arena, but if you’re just looking to fiddle around with different sounds, the DigiTech will be a nice addition to your pedal collection. 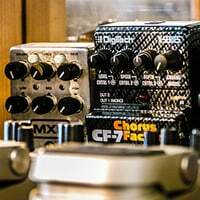 The Zoom G1on is a lot like one of my favorite pedals, the G3X (except much more compact), and features 75 effects, 14 amp models, and 100 effects. With these built-in features, you can’t go wrong, especially since it’s only $49.99. 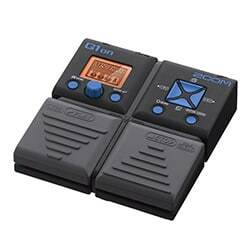 In the world of low-cost mutli-effects pedals, I can’t think of a better brand name than the Japanese company, Zoom. You will very rarely if ever find any Diamond, Wampler, or Keeley pedals in the under $50 category. But that’s okay, because, they have their place in the effects pedals market, and the inexpensive ones have their place too. If you’re just looking for gratification and bang for buck, there are plenty of great pedals to explore, even if you’re on a budget. Update: If you’re looking for a similar set up to Ed Sheeran’s Chewie Monsta Looper pedal, you’ll want to check our blog post on where to buy a Chewie 2. He used this setup at the Grammys, so while it costs a bit to set up, you know it’s a pedal set up that works well.